Ideally set at the centre of Puerto del Carmen - the largest and liveliest resort on the island of Lanzarote - Apartamentos Acuario Sol offer easy access to some of the best beaches on the island. The apartment complex is blessed with an all-year-round Canarian sunshine, which makes sun-lounging quite a pleasant experience. One could also revel in the summer sun on the grand pool terrace, make the most of the on-site solarium, or choose to take a casual stroll along the magnificent Playa Blanca beach. The main promenade of Avenida de la Playas, which lies just 350m from the apartment complex, is lined with a range of shops, bars and restaurants. Together they make your stay at the Acuario Sol Apartments Complex an incredible experience. 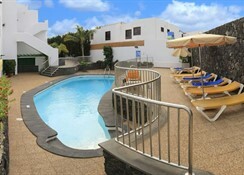 Situated in Lanzarote’s most popular resort area, Puerto del Carmen, the Apartamentos Acuario Sol lies at a distance of 8km from the airport and just 13km from the capital city of Arrecife. Guests can choose from spending time at the beach, just 200 meters away from the complex, or drive down to Playa Flamingo to indulge in some exhilarating water sports. The main promenade of Avenida de la Playas, which is lined with numerous shops, restaurants and bars, is just a short walk away from the hotel. Guests can shop, dine or simply lounge around enjoying the sights of this lovely beach resort. 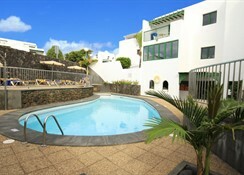 The Apartamentos Acuario Sol offer 85 self-catering one- and two-bedroom apartments with garden or pool views. The rooms are done up in white and are equipped with satellite TV sets, adjoining terraces, and kitchen counters, which come with hob burners, refrigerators, kettles, utensils and toasters. Guests who wish to always be a part of all the fun and action can opt for rooms with a pool view, while those who prefer to lay back and relax can go for the rooms with garden views and sun terraces. The bedrooms set around the pools and terrace areas accommodate twin beds, while the lounge area offers a pull-out sofa bed as well. To complement a lively holiday under the sun, the apartment complex provides just the right number of choices to treat your taste buds. The complex’s on-site restaurant provides continental breakfast to its guests, while the pool snack bar offers occasional food nights, apart from a huge range of light snacks throughout the day. The restaurants of main resort lie just 250m from the complex and there is always the option to visit the nearby supermarket to pick up local food and beverages. Guests can also go for the self-catering options, cook their own meal in the fully-equipped kitchenette, and enjoy freshly-made dishes on the terrace or balcony. 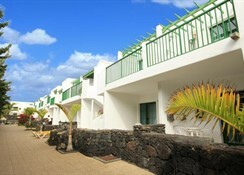 Apartamentos Acuario Sol are only a few hundred metres from the spectacular beaches of Puerto del Carmen and Lanzarote, where you can swim in the cool Atlantic waters, or play on the beach with all the family. The outdoor swimming pool that is dotted with sun loungers allows guests to spend a relaxing time with their favourite book. There are several bars and restaurants around the hotel for you to explore and enjoy the local traditions, cuisines and attractions. All children under two years stay free of charge for children’s cots/cribs. The maximum number of children’s cots/cribs allowed in a room is one.